OS Grid Reference: SN 10063 43195. The Neolithic burial chamber Llech-y-Dribbed, or Llech-y-Trypedd, stands on private land 25 metres to the west of a farm track at the south-west side of Penlan Farm, and ¾ of a mile from the village of Moylgrove, in Pembrokeshire. 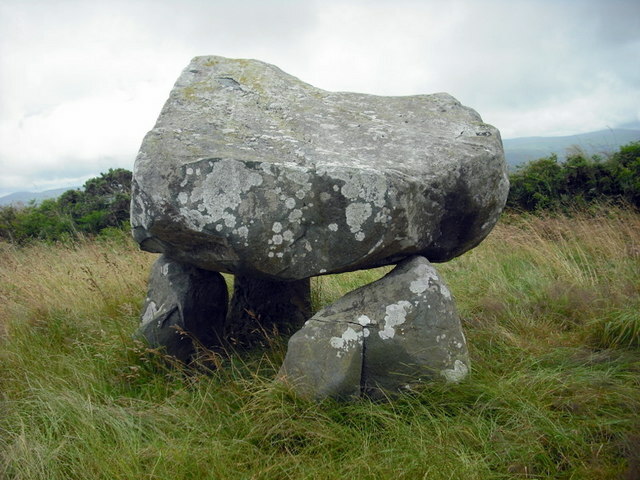 It has been variously described as a cromlech, a quoit and a dolmen. And from some distance away this ancient megalithic monument looks quite eerie – and it has the appearance of an alien space-craft that has just landed, but close-up it becomes a tripod or triangular-shaped lump of stone on three smaller up-right stones, hence its occasional name ‘The Tripod Stone’. Local legend says that the large capstone was hurled from the top of Carn Ingli, near Nevern, by a local giant called Samson, although we don’t know whether this was St Samson, who is associated with other megalithic tombs in this part of Wales. http://www.geograph.org.uk/photo/1426936 © Copyright Bob Helms and licensed for reuse under this Creative Commons Licence. Sykes, Homer., Celtic Britain, Pheonix Illustrated Orion Publishing Group, London WC2. 1998. Categories: Burial Chamber, Cromlech | Tags: Llech-y-Dribedd near Moylgrove in Pembrokeshire | Permalink.